A Pregnant woman and her baby were killed, and 25 other civilians, including 4 children and 4 women, were wounded. The Said al-Mishal Institute for Culture and Science was destroyed and nearby houses and shops sustained material damage. Israeli forces continued to open fire at the border areas in the Gaza Strip, but no injuries were reported. Israeli forces conducted 73 incursions into Palestinian communities in the West Bank and 4 similar incursions were conducted in Jerusalem. 6 civilians, including 2 children, were wounded during the incursions. 71 civilians, including 3 children, 12 women, were arrested. 18 of them, including 10 women, were arrested in Jerusalem. 2 under-construction apartments were demolished in al-‘Issawiyia village. Notices were fixed to confiscate dozens of dunums of Silwan village’s lands under the pretext of “gardening free lands”. An under-construction house was demolished in Dir Dabwan village, east of Ramallah. A shop was demolished in Marj Na’jah village, north of Jericho. 5 shooting incidents were reported against the Palestinian fishing boats in the Gaza Sea, but no injuries were reported. 4 Palestinian civilians, including a child, were arrested at military checkpoints in the West Bank. Israeli violations of international law and international humanitarian law in the oPt continued during the reporting period (09 – 15 August 2018). At approximately 00:20, Israeli warplanes launched 3 missiles at Tunis site belonging to Palestinian resistance groups in al-Zaytoun neighborhood, east of Gaza. As a result, a Palestinian sustained an incised wound due to glass, which scattered on him while he was in his house that is located around the site. At approximately 1:00, Israeli warplanes launched a missile at an empty land, south of Gaza, but no casualties were reported. At approximately 1:15, Israeli warplanes and drones launched 3 missiles at a site belonging to Palestinian resistance groups, northwest of al-Mughraqa village in the central Gaza Strip . As a result, the site sustained serious material damage. However, no casualties were reported. At approximately 1:20, Israeli warplanes launched 4 missiles at a training site belonging to Palestinian resistance groups (former Civil Administration), west of Jabalia in the northern Gaza Strip. As a result, the site sustained serious material damage. However, no casualties were reported. Around the same time, Israeli warplanes launched a missile at al-Ra’ad site belonging to Palestinian resistance groups in al-Tuffah neighborhood, northeast of Gaza City. As a result, the site sustained serious material damage, but no casualties were reported. Around the same time, Israeli warplanes and drones launched 6 missiles at a site belonging to the Palestinian resistance groups, adjacent to Salah Eden Street in Deir al-Balah, in the central Gaza Strip. As a result, the site sustained serious material damage, but no casualties were reported. Around the same time, Israeli forces moved into ‘Ainabous village, south of Nablus. They raided and searched a house belonging to ‘Adel Taleb Mahmoud Hamad (27). The Israeli forces then arrested ‘Adel and confiscated a GCB digger belonging to the father of the abovementioned civilian, who is the Head of the Local Council. At approximately 2:00, Israeli forces moved into Dora, southwest of Hebron. They raided and searched a house belonging to Nadim Bassam Faqoosa (20) and then arrested him. Around the same time, Israeli forces accompanied with 2 military vehicles moved into al-Hawouz neighborhood in the south-western area of Hebron. They raided and searched a house belonging to Islam Mohammed al-Khatib al-Tamimi (28) and locked the family members in the living room. An Israeli officer then handed Islam a summons to refer to the Israeli Intelligence Service in “Gush Etzion” settlement complex, south of Bethlehem. Around the same time, Israeli warplanes launched 2 missiles at Bader site belonging to Palestinian resistance groups, northeast of al-Shati’a refugee camp, west of Gaza City. As a result, the site sustained serious material damage, but no casualties were reported. At approximately 2:15, Israeli forces moved into Tulkarm refugee camp, east of Tulkarm. They raided and searched a house belonging to Mohammed Ziyad Farhana (33) and then arrested him. Around the same time, Israeli forces moved into Aqabat Jaber refugee camp, south of Jericho. They raided and searched several houses after which they arrested 2 civilians namely Khalil Jamal al-Sheikh Ibrahim (24) and Ahmed ‘Ali al-Sheikh Ibrahim (25). At approximately 2:20, Israeli warplanes launched 2 missiles at al-Qadisiyia site belonging to Palestinian resistance groups, adjacent to al-‘Atatra Governmental Clinic, in al-Salateen neighborhood in Beit Lahia in the northern Gaza Strip. 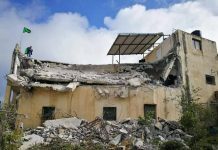 As a result, the site and a water well belonging to Beit Lahia Municipality were fully damaged. This water well, which is located in the north side of the site, feeds al-Sefa, al-‘Amoodi areas and a large part of al-‘Atatra area. Moreover, 8 civilians, including 5 children, sustained incised wounds due to the scattering glass on them. In addition, many houses, commercial shops and a petrol station sustained serious material damage as the walls were cracked and the windows glass broke down. At approximately 3:25, Israeli warplanes launched 2 missiles at a training site belonging to Palestinian resistance groups, adjacent to al-Nawras Resort, southwest of Beit Lahia in the northern Gaza Strip. As a result, the site sustained serious material damage. However, no casualties were reported. Around the same time, Israeli warplanes launched 2 missiles at Abdul ‘Aziz al-Rantisi site in al-Twan neighborhood, west of Jabalia, north of the Gaza Strip. As a result, the site sustained serious material damage and a member of the police rapid intervention force sustained shrapnel wounds to his right foot. Moreover, a child sustained incised wound to his head due to the scattering glass while on them while they were at their house. At approximately 3:40, an Israeli drone fired a missile at al-Jedar site belonging to Palestinian resistance groups, in Beit Lahia in the northern Gaza Strip. As a result, the site sustained material damage and a civilian sustained a fracture to the pelvis. At approximately 3:00, Israeli warplanes launched a missile at an empty land, south of Gaza. However, no casualties were reported. Around the same time, Israeli forces moved into Bethlehem and stationed in Hendaza area, in the center of the city. They raided and searched a house belonging to Samih Mousa Nawawra (23) and then arrested him. At approximately 4:20, Israeli warplanes launched 2 missiles at a training site belonging to Palestinian resistance groups, adjacent to al-Nawras Resort, southwest of Beit Lahia, in the northern Gaza Strip. As a result, the site sustained material damage, but no casualties were reported. Around the same time, Israeli warplanes launched 2 missiles at a training site belonging to Palestinian resistance groups, northwest of Beit Lahia in the northern Gaza Strip. As a result, the site sustained material damage. However, but no casualties were reported. Around the same time, Israeli warplanes launched 4 missiles at al-Yarmouk site, belonging to Palestinian resistance groups, east of al-Shija’iyah neighborhood, east of Gaza City. However, no casualties were reported. At approximately 6:00, an Israeli drone fired a missile at a group of Palestinian of resistance members in the east of al-Buraij refugee camp, in the central Gaza Strip. As a result, 4 members of armed resistance groups were wounded. Doctors classified the one civilian’s injury a s serious. At approximately 10:00, Israeli warplanes launched 3 missiles at a site belonging to al-Qassam Brigades (the Military Armed Wing of Hamas Movement) in Tabet Zare’a neighborhood, northeast of Rafah, south of the Gaza Strip. As a result, the site sustained large material damage, but no casualties were reported. Around the same time, Israeli warplanes and drones launched 2 missiles at a site belonging to Palestinian resistance groups, off the seashore, southwest of Deir al-Balah, in the central Gaza Strip. As a result, the site sustained material damage. Moreover, 2 young men, who work in a nearby resort, sustained bruises and wounds. At approximately 10:05, Israeli warplanes launched 2 missiles at an empty land located in the vicinity of al-Hussari agricultural land, northwest Beit Lahia, north of the Gaza Strip. However, no causalities were reported. At approximately 10:10, Israeli warplanes launched a missile at an empty land located in the vicinity of al-Baidar Wedding Hall, southwest of Gaza City. However, no causalities were reported. At approximately 17:45, an Israeli warplane launched a missile at the Sa’ed al-Mishal Cultural Centre located on ‘Aydiyia Street in Southern al-Rimal neighborhood, west of Gaza City. The 400-sqaure-meter building was comprised of 5 floors, which includes the Egyptian community’s office. The Sa’ed al-Mishal Cultural Centre is one of the most important cultural and artistic centers in the Gaza Strip. At approximately 18:15, Israeli warplane launched 5 warning missiles at the building. At approximately 18:20, the Israeli warplane 4 missiles at the abovementioned building. As a result, the building was totally destroyed and turned into rubble, and the neighborhood buildings sustained severe damage. Due to the scattered rubble, 24 civilians were wounded and taken to al-Shifa Hospital, including 4 women and 4 children. Doctors classified their injuries as minor. Among the wounded civilians was Yusuf Ziyad Mohammed Lubbad (29), a photojournalist at al-Aqsa TV Channel, suffered broses and wounds due to the scattered glass. Note: During the aforementioned day, Israeli forces conducted (5) incursions in the following areas and no arrests were reported: Halhoul, Beit Ummer, Sa’ir and al-Kume villages in Hebron; and Kafel Hares village, north of Salfit. At approximately 01:30, Israeli forces moved into al-‘Aroub refugee camp, north of Hebron. They raided and searched a house belonging to Anas ‘Essa Ayoub (23). They handed a summons to Anas to refer to the Israeli Intelligence Service at “Gush Etzion” settlement complex ,south of Bethlehem. Meanwhile, another Israeli force raided and searched a house belonging to Mohammed Ahmed Abu Rayya (22) near the Roman ponds, east of the camp, and handed him a similar summons. At approximately 13:00, Israeli forces moved into Taqou’a village, east of Bethlehem, and stationed around al-Kherbah area. Dozens of Palestinians young men and children gathered and threw stones and empty bottles at Israeli soldiers, who fired a barrage of live and rubber bullets and gas canisters at them. As a result, a young man was injured in his leg. A recorded video documented the young man’s injury, his fall on the ground, and his admission by a private car to a field medical point and then his transference to the hospital. It should be noted that Israeli forces moved into the village on Thursday evening, in which clashes erupted between Palestinian young men and the Israeli soldiers. As a result, a Palestinian young man was hit with a rubber bullet to the head. He was then transferred to a hospital for medical treatment. At approximately 19:30, Israeli forces stationed along the border fence between Israel and the Gaza strip fired an artillery shell at a residential house, southeast of al-Buraij, in the central Gaza Strip. The 3-storey house belonging to Mousa Ahmed abu ‘Abda (70) is built on an area of 145 square meters and inhabited by 5 families comprised of 28 individuals. As a result, the house was partially damaged, but no casualties were reported. At approximately 06:00, Israeli gunboats stationed off former al-Waha shore, northwest of Beit Lahia in the northern Gaza strip, sporadically opened fire at Palestinian fishing boats sailing within 3 nautical miles and chased them. the shooting continued until approximately 06:15 on the same day. As a result, the fishermen were forced to flee fearing for their lives, but neither casualties nor material damage was reported. At approximately 15:25, an Israeli drone fired a missile at a group of civilians who were walking in the vicinity of al-Shuhada’a Islamic Cemetery, east of Jabalia in the northern Gaza Strip, but neither casualties nor material damage was reported. At approximately 15:30, an Israeli drone fired a missile at a group of civilians who were in the east of al-Buraij in the central Gaza Strip, but neither casualties nor material damage was reported. At approximately 16:10, an Israeli warplane launched a missile at a group of civilians who were near Malakah intersection, east of al-Zaytoun neighborhood in the eastern Gaza Strip. As a result, a 21-year-old civilian from al-Sheja’eya neighborhood was with a shrapnel to the right hand. Doctors classified his injury as minor. 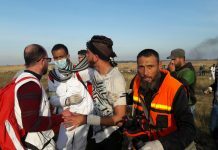 At approximately 16:15, an Israeli drone fired a missile at a group of civilians who were walking in the vicinity of al-Shuhada’a Islamic Cemetery, east of Jabalia in the northern Gaza Strip, but neither casualties nor material damage was reported. Following that, Israeli forces issued a statement declaring that the Israeli warplanes targeted Palestinian cells, claiming that they participated in setting fires by flying incendiary kites and balloons to the settlements near the Gaza enclave. Note: During the aforementioned day, Israeli forces conducted (5) incursions in the following areas and no arrests were reported: ‘Azzoun village, east of Qalqiliyah; Dura; Hebron; Beit al-Roush village and al-‘Arroub refugee camp. At approximately 02:00, Israeli forces moved into Halhoul, east of Hebron, and stationed in al Tharwa neighborhood. They raided and searched 2 houses belonging to Akram Mohammed Jabarat(21) and ‘Odai Mohammed No’man (22) and then arrested them. At approximately 08:00, Israeli gunboats stationed offshore, adjacent to former al-Waha shore, northwest of Beit Lahia in the northern Gaza Strip, heavily opened fire at Palestinian fishing boats sailing within 2 nautical miles and chased them. Israeli gunboats surrounded a Palestinian fishing boat belonging to Nasser Fadel Hasan Baker (55). The fishing boat was manned by Nasser and his sons: Yasser (26), Fadel (19); and Mubarak (15), and his brother, Hassan (31). The Israeli naval soldiers ordered them to take off their clothes and swim towards the Israeli gunboat. They then arrested them. At approximately 13:30, Israeli forces moved into ‘Azzoun village, east of Qalqiliya. They raided and searched a construction workshop in the eastern area of the village, adjacent to “Ma’ale Shamron” settlement, and then arrested two workers identified as Ayman Omar al-Hafeth ‘Edwan (18) and Abbas Mohammed Badwan (27). Note: During the aforementioned day, Israeli forces conducted (5) incursions in the following areas and no arrests were reported: ‘Azzoun village, east of Qalqiliya, al-Shuyoukh, Tarqumiya and Beit Ummer, and al-‘Aroub refugee camp in Hebron..
At approximately 02:00, Israeli forces moved into Jaba’ village, south of Jenin. They raided and searched a house belonging to Nazeeh Sa’eed Abu ‘Oune (58) and then arrested his son, Islam (27). Around the same time, Israeli forces moved into al-Zababdah village, southeast of Jenin. They raided and searched a house belonging to Muhanna Khalid al-Sharqawi (42) and arrested him. At approximately 02:30, Israeli forces moved into Qalqiliya, and stationed in Kafer Saba neighborhood amidst firing sound bombs and tear gas canisters. They raided and searched a house belonging to the family of Ahmed Qasem Dawoud (17) and then arrested him. At approximately 03:00, Israeli forces moved into Beit Fajjar village, south of Bethlehem. They raided and searched a number of houses and then arrested 2 civilians identified as Mohammed Khalil Ibrahim Thwabtah (19) and Malik Eyad Thwabtah (18). At approximately 04:00, Israeli forces moved into Beit ‘Our al-Tahta village, west of Ramallah. They raided and searched a house belonging to Shehada Ayyoub al-Kurdi (28) and then arrested him. At approximately 17:00, Israeli forces moved into Ya’bud village, southwest of Jenin. They raided and searched a number of commercial shops in the center of the village and questioned the owners under the pretext of looking for civilians who threw stones at the Israeli military vehicles. The Israeli forces then arrested Mohammed Bilal Abu Baker (15) from the main street and took him into “Mafi Dotan” military checkpoint on the main street and released him later. At approximately 21:00, Israeli forces moved into Safa area, northwest of Beit Ummer village, north of Hebron, and stationed in the vicinity of al-Ta’amra houses in the neighborhood. A number of youngsters gathered, set fire to tires and threw stones at Israeli soldiers, who fired sound bombs and gas canisters against the civilians and houses. Meanwhile, another Israeli force raided and searched several houses, damaged their contents, attacked a number of young men and then arrested 4 of them identified as: Ghazi Mohammed Ahmed Ismail ‘Aadi (25), Mohammed Ismail Hammad (20), Dya’a Farouk ‘Adi (22), Mohammed Farouk ‘Aadi (19). The soldiers took the arrestees to a distance of about 300 meters away to the place where military vehicles stationed. The youngsters closed the main road of the neighborhood and threw stones at the soldiers and the vehicles. The Israeli soldiers fired live and rubber bullets at them. As a result, a 15-year-old child was hit with a rubber bullet to the right foot and an 18-year-old civilian was hit with a live bullet to the right foot and a live bullet shrapnel to the abdomen. One of the two wounded civilians was transferred to al-Ahli Hospital in Hebron while the other received medical treatment on spot. Note: During the aforementioned day, Israeli forces conducted (9) incursions in the following areas and no arrests were reported: ‘Anabta and Kufor al-Lubbed villages, east of Tulkarm; Dura, al-Samo’a, al-Surrah villages and al-‘Arroub refugee camp in Jenin; ‘Azzoun village, east of Qalqiliyah; and Joyous village, north east of the city. At approximately 01:00, Israeli forces moved into Nablus. They raided and searched several houses and then arrested Husam ‘Emad al-‘Amoudi (38) from his house on Kashikah street in Ras al-‘Ein neighborhood, south of the city, and Mohanned Mo’een Tabanjah (21), a student at An-Najah National university, who was at his house in Khelat al-‘Amoud neighborhood, southeast of the city. Around the same time, Israeli forces moved into ‘Asker refugee camp, northeast of Nablus. They raided and searched a house belonging to Islam ‘Anan Bashkar (20) and then arrested him. At approximately 02:00, Israeli forces moved into Rujeib village, southeast of Nablus. They raided and searched a house belonging to Bara’a Na’el Duweikat (22), a student at An-Najah National University, and arrested him. Around the same time, Israeli forces moved into Burin village, south of Nablus. They raided and searched a house belonging to Montaser Khader al-Najjar (20) and then arrested him. Around the same time, Israeli forces moved into Husan village, west of Bethlehem. They raided and searched a house belonging to Ibrahim Khalid Hamamrah (18) and then arrested him. Around the same time, Israeli forces moved into several neighborhoods in Hebron. They raided and searched 2 houses belonging to Sa’edah Mohammed ‘Essa Bader (57), the wife of Mohammed Bader, member of the Palestinian Legislative Council (PLC), and Sonia Saif Eden al-Hamouri (47). Around the same time, Israeli forces accompanied with military vehicles and a mounted-crane truck moved into Roq’ah area, west of Yatta, south of Hebron. They raided and searched Abu Ya’qoub Lathe Workshop. The soldiers confiscated part of the contents and damaged what was left. They also fixed a notice on the workshop’s door, saying that it ” helps terrorists”. The workshop belongs to Emad Ya’qoub Abu Turruk (44), who was arrested along with his son Ya’qoub (20) after the Israeli forces raided their house in al-Fahes area. At approximately 02:30, Israeli forces moved into Tulkarm. They raided and searched a house belonging to Suheib Mahmoud Ahmed al-Husari (29) and then arrested him. At approximately 03:00, Israeliforces moved into ‘Aqabet Jaber refugee camp, south of Jericho. They raided and searched a number of houses and then arrested 4 civilians namely Ahmed jihad Abu al-‘Asal (35), his brother Yusuf (22), Yusuf Suleiman Karshan (24) and Dawoud Khalil Abu Dahouk (24). At approximately 03:30, Israeli forces moved into Deir Ghasanah village, northwest of Ramallah. They raided and searched a house belonging to Mahmoud Yusuf al-Barghouthi (53) and then arrested him. Around the same time, Israeli forces moved into Beit Rema village, northwest of Ramallah. They raided and searched a house belonging to Mazen Redwan al-Remawi (45) and then arrested him. At approximately 04:50, Israeli forces moved into Kharbatha al-Mesbah village, northwest of Ramallah. They raided and searched a house belonging to Saleh Jamal ‘Atiyah (44) and then arrested him and his son Mahmoud (20). Around the same time, Israeli forces moved into ‘Aboud village, northwest of Ramallah and stationed near the Church neighborhood. They raided and searched a house belonging to ‘Adnan ‘Awad al-Barghouth (26) and then arrested him. Around the same time, Israeli forces moved into Deir Qdais village, west of Ramallah. They raided and searched a house belonging to ‘Arafat ‘Atta Nasser (22) and then arrested him. At approximately 07:00, a group of Israeli undercover units “Mista’arvim” dressed like Palestinian civilians sneaked al-Duheishah refugee camp, south of Bethlehem, using a civilian car with a Palestinian registration plate and a car for food storage. The 2 cars stopped on the road and a number of the undercover agents stepped out of them. They arrested Diya’a Khalil al-Ja’fari (27) while he was at the main entrance to the camp. Meanwhile, Israeli soldiers stepped out of the other car to protect the “Mista’arvim” and heavily fired live bullet to disperse young men, who attempted to prevent arresting al-Ja’fari. As a result, a 16-year-old child was hit with a live bullet to the foot. He was admitted to Bethlehem Arab Society for Rehabilitation to receive medical treatment. Meanwhile, another Israeli forces moved into the eastern neighborhood of the camp. They raided and searched a house belonging to Ramez Yusuf al-Laham (21) and then arrested him. At approximately 22:30, Israeli naval soldiers pumped wastewater at Palestinian fishing boats sailing within 3 nautical miles off Deir al-Balah shore in the central Gaza Strip. as a result, the fishermen were forced to sail back few meters. Note: During the aforementioned day, Israeli forces conducted (3) incursions in the following areas and no arrests were reported: al-Shuyoukh, Sa’ir and al-Kume villages in Hebron. At approximately 01:30, Israeli forces moved into Tubas. They raided and searched several houses after which they arrested Omer Hamzah Hasan Daraghmah (50) and Ibrahim Samih Yusuf Sawaftah (30). Around the same time, Israeli forces moved into Tamoun village, southeast of Tubas. They raided and searched a house belonging to Islam Abdullah Tubasi (27) and then arrested him. At approximately 02:00, Israeli forces moved into Taqou’a village, east of Bethlehem. They raided and searched a number of houses after which they arrested Mousa Khalil al-‘Ammour (17) and former prisoner ‘Awadallah ‘Adel al-‘Ammour (20). At approximately 03:40, Israeli forces moved into Barham village, northwest of Ramallah. They raided and searched a house belonging to ‘Ali Dar ‘Ali (35), a reporter at Palestine TV Channel, and then arrested him. It should be noted that Israeli forces previously opened fire at ‘Ali , causing him wounds while he was covering the Israeli forces violations against Palestinian civilians in the West Bank areas. At approximately 09:00, Israeli gunboats stationed of former al-Waha shore, northwest of Beit Lahia in the northern Gaza Strip, heavily opened fire at Palestinian fishing boats sailing within 3 nautical miles and chased them. As a result, the fishermen were forced to flee fearing for their lives, but neither casualties nor material damage was reported. 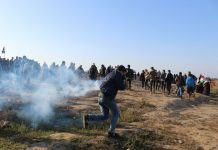 At approximately 09:30, Israeli soldiers stationed behind the border fence between the Gaza Strip and Israel, east of Deir al-Balah in the central Gaza Strip, opened fire at Palestinian farmers while they were working in their lands. As a result, the farmers were forced to leave their lands fearing for their lives, but no casualties were reported. Note: During the aforementioned day, Israeli forces conducted (4) incursions in the following areas and no arrests were reported: the center of Hebron, Beit Ummer and Kharas villages in Hebron; and ‘Azzoun village, east of Qalqiliyah. On Wednesday, 08 August 2018, Israeli authorities allowed 16 persons; on Thursday, 09 August 2018; 4 persons; on Sunday, 12 August 2018, 5 persons; and on Tuesday, 14 August 2018, 2 person to return to the West Bank. On Sunday, 12 August 2018, Israeli authorities allowed a doctor to travel via the crossing to attend a medical course. On Tuesday, 14 August 2018, Israeli authorities allowed a doctor to travel via the crossing to attend a medical course. On Sunday, 12 August 2018, Israeli authorities allowed one person; and on Tuesday, 14 August 2018, 4 persons, who work at the General Authority of Civil Affairs (GACA) and internationals to renew their permits. On Saturday, 11 August 2018, Israeli forces established 3 checkpoints at the entrances to ‘Ain Yabrood and Silwad villages, northeast of Ramallah, and at the entrance to Kubar village, north of the city. On Thursday, 09 August 2018, Israeli forces established 3 checkpoints at the western entrance to Hebron and at the entrance to al-Shayyoukh and Beit Ola villages. On Friday, 10 August 2018, 3 similar checkpoints were established at the entrance to Tarama and al-Shayyoukh villages, and at the entrance to al-Fawar refugee camp. On Saturday, 10 August 2018, Israeli forces established 3 checkpoints at the entrance to Tarqumiyia village and on Kharras and Abu Risha roads. On Sunday, 11 August 2018, 4 similar checkpoints were established at the entrances to al-Dahiriyia and Dir Samet villages, at the northern entrance to Halhoul village, and at the entrance to al-Fawar refugee camp. On Monday, 13 August 2018, Israeli forces established 4 checkpoints at the entrances to Beit Ummer, Bani Na’iem and al-Hadab villages, and at the southern entrance to Halhoul village. On Tuesday, 14 August 2018, 2 similar checkpoint were established at the entrance to al-Fawar refugee camp and at the entrance to Beit Ummer village. On Wednesday, 15 August 2018, Israeli forces established 4 checkpoints at the entrances to Sa’ir, al-Shayyoukh, al-Moreq and Dir al-‘Asal villages. Nablus: Israeli forces established (7) checkpoints all over the city. At approximately 15:00 on Thursday, 09 August 2018, Israeli forces established a checkpoint at the intersection of al-Naqoura village, branching from Nablus-Jenin Street, northwest of Nablus. They re-established the checkpoint in the same area at approximately 09:00 on Saturday, 11 August 2018, and at approximately 17:00 on Sunday, 12 August 2018. On Sunday, 12 August 2018, Israeli forces established a checkpoint at the south-western entrance to Nablus. At approximately 07:30 on Monday, 13 August 2018, a similar checkpoint was established at the entrance to Beit Foreek village, east of the city. At approximately 19:30 on Monday, Israeli forces established a checkpoint at the eastern entrance to Bureen village, south of Nablus. On Wednesday, 15 August 2018, Israeli forces stationed at Za’tara checkpoint, south of Nablus, tightened their arbitrary measures against Palestinian civilians. They stopped Palestinian vehicles and checked the passengers’ IDs. 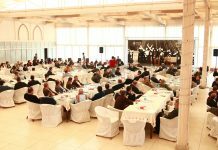 This came in coincide with heading thousands of workers and employees, who are from the northern West Bank, to Ramallah. As a result, the workers and employees’ arrival to their work were obstructed. At approximately 17:50 on Friday, 10 August 2018, Israeli forces established 2 checkpoints between ‘Azoun and Sir villages and at the entrance to ‘Azoun village, east of Qalqilayia. At approximately 10:00 on Saturday, 11 August 2018, Israeli forces established a checkpoint between ‘Izbit Salman and Ras ‘Atiyia villages, south of Qalqiliyia. At approximately 18:50, a similar checkpoint was established at the entrance to ‘Izbit al-Tabeeb village, east of the city. At approximately 16:00 on Sunday, 12 August 2018, Israeli forces established a checkpoint at the eastern entrance to Qalqiliyia. On Monday, 13 August 2018, 4 similar checkpoint were established at the eastern and southern entrance to Qalqiliyia, between Jayyous and ‘Azoun villages, and between ‘Azoun and ‘Izbit al-Tabeeb villages, east of the city. At approximately 12:00 on Thursday, 09 August 2018, Israeli forces established a checkpoint at the entrance to Qarawet Bani Hassan village. At approximately 21:30, a similar checkpoint was established at the entrance to Dir Balout village, west of Salfit. At approximately 19:45 on Monday, 13 August 2018, Israeli forces established a checkpoint at the entrance to Qarawet Bani Hassan village, northwest of Salfit. At approximately 21:50, a similar checkpoint was established at the eastern entrance to Yasouf village, east of the city. Tulkarm: Israeli forces established (4) checkpoints all over the city. At approximately 20:10 on Saturday, 11 August 2018, Israeli forces established a checkpoint near al-Kafriyat Road, south of Tulkarm. At approximately 20:00 on Sunday, 12 August 2018, Israeli forces tightened their measures at ‘Inab military checkpoint, east of Tulkarm, and the road witnessed traffic congestion. The Israeli forces detained vehicles entering and exiting the abovementioned checkpoint and searched them. They also obstructed the vehicles’ movement. At approximately 22:20 on Thursday, 09 August 2018, Israeli forces established a checkpoint at the southern entrance to Jericho. At approximately 22:20 on Thursday, 09 August 2018, Israeli forces established a checkpoint at the main entrance to al-Nabi Saleh village, northwest of Ramallah. They searched Palestinian civilians’ vehicle and checked their IDs. After that, the Israeli forces arrested ‘Alaa Akram al-Barghouthi (27) while he was heading to Beit Rimah village, and then took him to a military watchtower established at the village’s entrance. At approximately 11:00 on Friday, 10 August 2018, Israeli Border Guard officers deployed in Hebron’s Old City, arrested Hani ‘Ayid Abu Isninah (12) after Israeli settlers attacking him near al-Ibrahimi Mosque. Hani was then taken to an investigation center in “ Kiryat ‘Arab’” settlement, east of the city. At approximately 09:50 on Tuesday, 14 August 2018, Israeli forces stationed at the gate established adjacent to the annexation wall near Qufeen village, northeast of Tulkarm, arrested Tawfiq Mohamed Salah Hirsha (23). At approximately 12:50 on Tuesday, Israeli forces arrested Esam Fayiz Sabbah, from ‘Oreef village, south of Nablus, near “Ariel “ settlement, north of Salfit. At approximately 00:00 on Thursday, 09 August 2018, Israeli forces moved into Qutnnah village, northwest of occupied East Jerusalem. They raided and searched a house belonging to Shadi Nabhan al-Faqieh (21) and then arrested him. At approximately 01:30 on Thursday, a large force of Israeli soldiers moved into Qalandai refugee camp, north of occupied East Jerusalem. They deployed in the camp’s neighborhoods, where they raided and searched dozens of houses. They then arrested 3 civilians and confiscated 4 vehicles. The arrested civilians were identified as ‘Ali Khaled Hamad (23), Basel Tawfiq Zayid (20) and Kamal Hazeen (26). The Spokesperson of the Israeli forces claimed that the Israeli forces confiscated means of combat, including locally-manufactured firearm, tear gas canisters and ammunition, and 4 vehicles claiming that they were stolen. At approximately 02:00 on Friday, 10 August 2018, Israeli forces moved into Ras al-‘Amoud neighborhood, east of occupied East Jerusalem’s Old City. They raided and searched a house belonging to Malek Jawdat Abu Isnienah (21) and arrested him. At approximately 12:30 on Saturday, 11 August 2018, Israeli police stationed at al-Aqsa Mosque’s Gates arrested 2 siblings after getting out of the mosque. Montaha Abu Shaqrah, sisters’ of the arrested, said that Israeli police stationed at al-Aqsa Mosque’s Gates stopped her brothers Qutibah Suliman Abu Shaqra (20) and Hasan (19) at al-Asbat (Lion’s) Gate and then arrested them. Qutibah and Hasan were then taken to al-Qashlah Police Station, west of Jerusalem, for interrogation. At approximately 11:00 on Sunday, 12 August 2018, Israeli forces stationed at al-Aqsa Mosque’s Gates in occupied East Jerusalem’s Old City, arrested Baraa’ al-Ghazawi (19) while getting out of the mosque. Baraa’ was then taken to al-Qashlah Police Station for investigation. At approximately 01:00 on Tuesday, 14 August 2018, Israeli forces moved into al-Qubibah village, northwest of occupied East Jerusalem. They raided and searched a house belonging to Nidal Mostafa Makhtoub (23) and then arrested him. On Wednesday, 15 August 2018, Israeli police deployed along streets leading to al-Aqsa Mosque and its gates in occupied East Jerusalem’s Old City, arrested 9 Palestinian women under the pretext that they were in Bab al-Rahma area. This came in coincide with storming al-Aqsa Mosque by Israeli settlers. After detaining them for few hours in an investigation center, the arrested women were released on one condition that they will deport from al-Aqsa Mosque. The arrested women were identified as Nahed Salah Abu Shaqrah, Samah Mahameed, Sajedah Mahameed, Ilaf Mahameed, Su’ad Abu Shaqrah, Maryam Jabareen, Fatemah Mousa, and Salsabeel Imarah.